Plastic A-frame sign printing lets you advertise right on the sidewalk outside your store. Don’t waste the opportunity to promote your business to passersby. 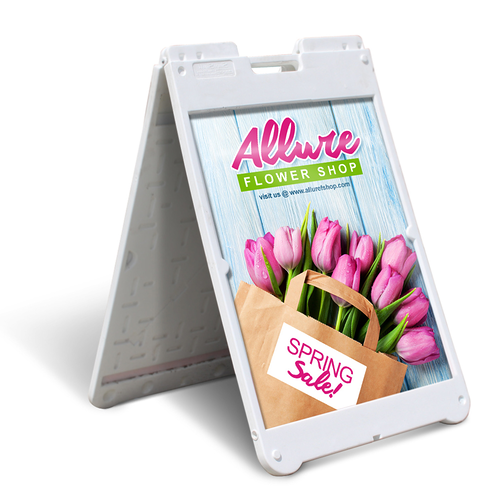 Plastic A-frame signs allow you to show off your brand to oncoming foot traffic, in direct line of sight. Plastic outdoor signs show potential customers your store, as they walk past, long before they get to your storefront. Plastic A-frame sign printing is also great for sales and promotions, allowing you to effectively advertise your offers. Each order comes with a white plastic frame and two single-sided corrugated plastic signs. Frame size is 24.375" x 37.25", and the graphic size is 22" x 28". Plastic sign boards are easily replaceable so you can change them depending on your signage needs. This makes seasonal ads or limited-time offers cost effective to promote. Our plastic signs are made from durable lightweight 3/16" corrugated plastic and the whole assembly is as equally at home in an indoor setting such as in malls and convention centers as it is out on the sidewalk. A-frame signs are especially popular with flower shops, ice cream parlors, barber shops, and hairdressers, and other small and medium businesses with a physical storefront. Order your plastic a-frame signs to be printed as soon as two business days.